Push Your Luck Podcast: The Ultimate PS Vita Twitch Game - Beat My Record! Its premise is simple: each level splits the screen into a grid which is filled with some squares. After you've tapped all the blue squares to make them grey, you advance to the next puzzle. From this core the game then adds a countdown timer. Then it adds red squares, which you can't touch without failing the level. Then it adds swiping, flipping, even pinching; that's a cool mechanic where you have to tap the Vita's screen and its underside at the same time to clear the blue square. 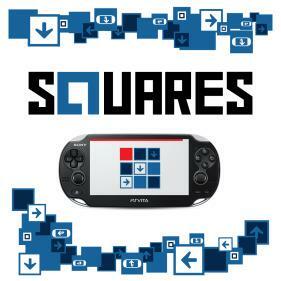 With these additions, Squares becomes a great twitch game that just dares you to beat it. Here's a level. Tap and swipe all the blue squares into grey before the timer runs out! The main game is simply awesome. It's full of 91 levels, each of which has about 3-5 puzzles that ramp up very quickly in difficulty. Again, just make the blue squares turn grey! Unfortunately it is a bit bare after you've beaten those levels, but you can create your own puzzles and share them with friends to keep the challenge going. I managed to beat the game in 50 minutes, which is still a world record. Go out there and claim it!